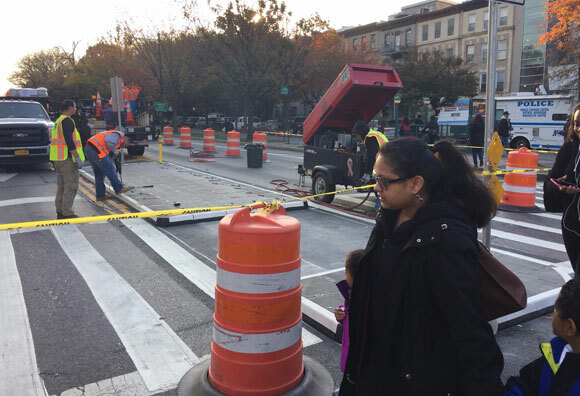 DOT has installed “removable rubber pedestrian islands” at two intersections on Eastern Parkway, two months after Mayor de Blasio authorized the removal of concrete pedestrian islands to ostensibly make room for the West Indian Day Parade. The concrete islands were only in place for about eight months. They were installed last December at Kingston Avenue and Brooklyn Avenue in response to an extensive public process for a Safe Routes to School project, but they were removed mere days before the parade without any public notification. 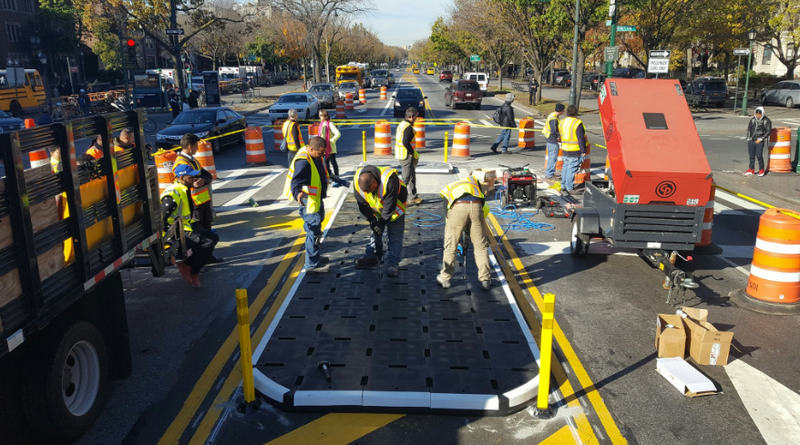 Yesterday, DOT began installing removable rubber islands in place of the concrete ones. The new islands are made of modular components and roughly match the dimensions of the ones they replaced, but they cannot anchor the heavy-duty bell bollards that provide a line of defense in the event a motorist drives into the refuge. This is the first such “removable rubber pedestrian refuge island” in the city, according to DOT. Eastern Parkway between Grand Army Plaza and Ralph Avenue is a Vision Zero priority corridor with five priority intersections, including Kingston Avenue, where seven people were injured from 2009 to 2013. Artista Prep Academy and Nursery School and Oholei Torah Yeshiva are nearby. The installation appeared to be mostly but not entirely complete by this morning, after starting yesterday. While it may seem like a lot of trouble to go through for a parade, the quick installation could prove useful at other locations. Rubber islands probably cost less than concrete islands (DOT has yet to respond to a request for cost details) and can be implemented much faster. What about the still extant concrete island in front of the Brooklyn Museum? Did we ever get to the bottom of who actually initiated this change after everyone involved, including the parade organizers, denied it? Where is the money to destroy the original islands and put these in coming from? I’m glad to see islands going back but this whole thing is still bizarre and doesn’t seem to have any logic behind it. This is something worth a longer-term public inquiry, since it still looks a bit fishy. It’s really not, though, one of the city’s big Vision Zero problems. Not even close. At least it is still design that attempts to do the job (we will see if it actually works), where so many other corridors lack any safety design at all, and that’s a huge issue. “Actual lack of safety” beats “optics” any day. True, though thinking about Vision Zero (and the $50 million from the City Council that the administration turned down) is what brought me to my money question. Is there an opportunity cost, another island or bumpout going unbuilt, or is the Mayor chipping in to repair his own meddling? Put on your rubber to be safe. Fundamentally, this is part of the pattern of non-transparent systematic abuse of power and influence. Everything from NYPD placard abuse to city officials illegally parking cars on sidewalks to (in this case) ripping out safety infrastructure with zero accountability or knowledge of just who was responsible for ripping out the infra. Had someone requested a rubber island a year ago, Im sure DOT would have said they “cant install an unproven and untested measure”. The good news is this can act as a pilot for everyone else. Why can’t it handle one of the bell bollards? Could one be screwed in or something? It would require a significant foundation below-ground, but something like that should be done to protect people here. Even so, if they could install the original bell bollard with a below-ground foundation why can’t they install a removable bollard with a below-ground foundation? Anyone know the manufacturer of this? If Streetsblog was Jeopardy!, the third and final round of Streetsies would be called "Potpourri."